I’ve had my Sony PRS-505 Reader Digital Book for a week now, and feel like I’m qualified to share some thoughts on it. First, some pros of E Ink devices in general (these go for Sony’s competitors like the Amazon Kindle as well). Minimal Eyestrain – E Ink reflects light just like regular ink, so it generally doesn’t put any more strain on your eyes to read it than a normal paper book would. In fact, an eReader can be even easier on your eyes as you can make any eBook large print with the push of the zoom/font-size button. It can also be read just as easily in bright sunlight, which is something LCD screens can’t match. Long, Long Battery Life – E Ink devices can last weeks on a single charge since they essentially only use electricity when what’s displayed on the screen is changed. Leaving a page displayed for days doesn’t drain the battery. Not Limited by Bookstore or Library Selection – A book not available locally? No need to wait for Amazon to ship it. Classics – Websites like Feedbooks and Manybooks have tens of thousands of public domain and creative commons books available to download for free. Multiple Books in One Device – No more worrying about dwindling bookshelf space. Also, take your whole library with you to the park/bus/vacation/gym/etc. Now for Sony PRS-505 specifics. More Book Buying Options – When it comes to DRM’d books, Kindle owners must buy from Amazon. With a Sony Reader, eBooks can be bought not just from Sony’s eBook store, but also from any store that offers Adobe’s Secure ePub or Secure PDF formats, such as Books On Board. This doesn’t mean the Sony has a larger selection of books available (Amazon actually has a slightly larger catalog). 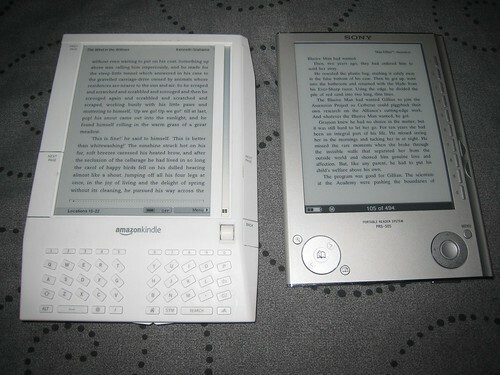 Smaller Than Kindle 1 or Kindle 2 (yet Same Screen Size) – No keyboard means a smaller device. No Wireless – Amazon comes with free cellular wireless, but says they’ll charge for it in future. The Sony can’t even connect to my home wireless (I really wish it could; don’t care much about the cellular). But the Sony PRS-505 can sync daily news and feeds using programs like Calibre or Feedbooks’ News Stand. eBooks Not as Cheap as Amazon – Amazon’s eBooks are usually $3-5 cheaper than the Sony eBook Store. But Sony’s store is still usually cheaper than paper books and regularly cheaper than other non-Amazon eBook stores. Also, Amazon is currently subsidizing their low prices and may raise them soon. Small Page Turn Buttons – Unlike Kindle’s paddles/flippers, the PRS-505 has smaller buttons that also require a little pressure. I got used to this very quickly, but for a day or two I’d occasionally find myself wishing I didn’t have to think about the button when I turned a page. On the plus side, the left buttons (great for holding the book with one while the cover’s attached) are very easy to hit. Limited Mac and Linux Support – Mac and Linux users can’t buy books from the Sony eBook Store, and while Mac users can use Adobe ePub/PDF for DRM books, Linux users don’t even have that option. Your average Linux user would have no trouble buying an eBook in a Linux supported format and stripping the DRM from it, but it’s still unfortunate to see an established OS shut out like this. I’m glad that I bought the PRS-505 (especially considering the great deal I got on it). However, regardless of the pros and cons I listed, I’d likely be just as pleased with a Kindle, Sony-700, or one of the other other E Ink devices currently available (seriously, I’m not saying the Sony is best, just that it’s quite good). I was just lucky that I happened to snag a bargain on the device I had a slight preference for. Wonderful review, and I don’t disagree on any one point with anything you said. I’m hoping that Amazon waits LATER rather than SOONER to charge for the Wireless, however to do charge if you want to convert and wireless send the file to the kindle, I think it’s 15cents a meg now. At least downloading books you bought from Amazon should always be free, and you can always use the USB cord to put your own docs on there without charges too. I’m so glad you like it! I am definitely in favor of anything that helps people read more. I’m most excited for your regarding all the free, non-DRM books you can download. Many of those will be the “classics,” which is great. I must say, I am impressed by eInk technology. It’s so lovely! I’ve got one PRS-505 on ebay. It needs 3~7 business days for shipping. Now I’m waiting… I feel so happy as I see your post. I brought the sony 505 last year, but after reviewing the kindle I wish I have waited for it. I don’t blame you. Although, PRS-505s are still selling on eBay for over $100. That would get you over half way to a Kindle’s price.